The songs that top the music charts are constantly changing, and we as DJs must keep up as part of our job. Branch Songs can help jump back generations, into any time and place in musical history. They allow we DJs to change gears with our sets, and give us greater freedom of selection. Certain songs work equally well with both teens and adults. I have searched through my musical database and put together some highlights that I think are a useful starting place for mobiles who want to get more creative in branching their musical selections. 2. “Dirty Bit (Time of Your Life)” by the Black Eyed Peas, which also has lyrics from the same movie. 1. “Live Your Life” by T.I. and Rihanna, covering the “Numa Numa” song by O-Zone that was made famous on Youtube. You know the one. It featured an obese man dancing in his chair to the song. 2. “Shake Senora” by Pitbull, Sean Paul, and T-Pain, which came from the ever so popular “Jump In Line” by Harry Belafonte. Both songs have a familiar tune with modern day lyrics, and offer an excellent way to branch into a Spanish music set. For those of you who like Techno music, you can start with one of my current favorites, “Play Hard” by David Guetta, NeYo, and Akon, which is a spin-off of Alice Deejay’s “Better Off Alone,” or “Sugar” by Flo-rida, which is a remake of “Blue (Da Ba Dee)” by Eiffel-65. Finally, the one which I could not categorize was “Eenie Meenie” by Sean Kingston and Justin Bieber. Generations of children have played this game and it is a song that brings back some fun memories of riding the bus to school, or recess out on the playground. I found the process of coming up with good Branch Songs to be really fun. Try looking through your music library to see what tunes you can creatively put together as Branch Songs. 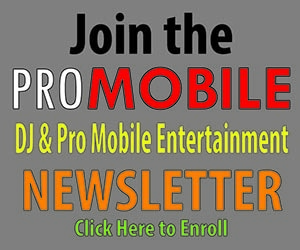 If you email them to me, ProMobileDJ.com will post everyone’s ideas on Facebook so we all have new ideas to add to our repertoires!